State House, Banjul, 24th January 2019 – His Excellency, President Barrow has assured Senegambian women leaders in business and entrepreneurship that his government is committed to creating the enabling environment in the sub-region for women to thrive in commerce. “When women move forward, society moves along with them. Women are integral to the transformation process of the new Gambia. 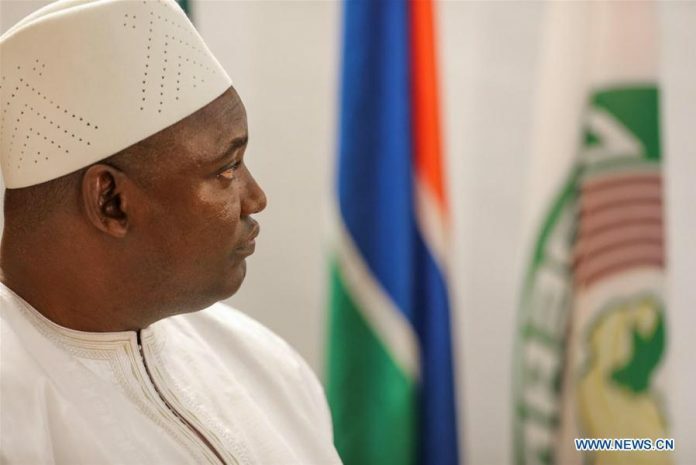 President Sall and I are committed to taking this Senegal-Gambia relation at all levels,” President Barrow said. The Senegalo-Gambian Network of Women Entrepreneurs and Leaders paid a courtesy call on the President at the State House on Wednesday to discuss the vision and mission of their organization as well as the challenges they face in facilitating trade between the two countries and beyond. President Adama Barrow told the women leaders that women’s advancement and empowerment are integral to his government’s development plan – the NDP 2018-2021 – which provides for the allocation D5 million annually to an entrepreneurship fund to promote women’s economic empowerment. President Barrow encouraged the women to be more innovative in their approach as successful entrepreneurship requires more in the current economic realities. The President promised that the officials would look into the hassles and delays at border crossings to minimize the associated vices. He added that his dream and that of President Sall is to have a borderless Senegambia. The group organized themselves to support its members from both countries in areas of trade, entrepreneurship and trainings. The women also run micro-finance schemes. They conduct exchange programmes with the support of various business chambers in Banjul and Kaolack. With the recent opening of the Senegambia Bridge, these efforts are billed to further enhance their collaboration in cross-border trade. However, the challenges of cross border security require the border security personnel to be thorough in the execution of their duties. The Director of Immigration, Mr. Seedy Touray, also re-echoed that the authorities would surely look into ways of making the checks less hassling for all. Mr. Touray further revealed the plan to convene cross-border talks in response to such concerns with his Senegalese counterparts. Saida Musu Koro Mbye, President of the Network said for the dream of unity to be realised, free movement of goods and persons across borders must be encouraged by authorities. Their network already has initiatives that support value addition to indigenous products on both sides of the border for local consumption. It is, among other things, meant to cut on imports of consumer products that could be produced locally in both countries. She also revealed that the network has already identified 100 women from each country for training in crafts, processing, storage, and marketing strategies. CEO of the Gambia Chamber of Commerce, Mr. Alieu Secka, said 65 per cent of participants in their trade fairs are women. They also participate in trade fairs in Kaolack, Dakar and vice versa. “With the right support, women can take us to depths we have never imagined,” Secka added. Accompanying the Senegambia Women’s Network at State House, the Director of Women’s Bureau, Fanta Bai Secka, seized the opportunity to advocate for a 30% women’s representation at all decision making levels in line with the UN recommendations and appealed for the political will for women to contribute effectively in national development.